This spacious duplex is located in a tropical paradise. 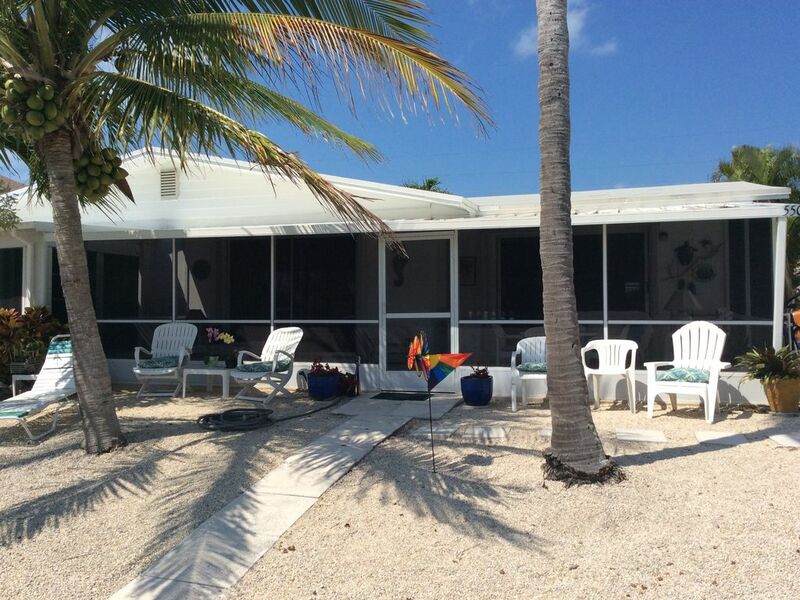 The property is on 11th Street, facing east, on the island city of Key Colony Beach at MM 54 in the Middle Keys (near Marathon). This is a canal-front unit with a 37-foot dock, fish cleaning table with light, and easy access to both the Atlantic Ocean and the Gulf of Mexico. The home features a new, large 29-foot screened porch fronting the canal (great place to dine), two bedrooms, two baths, great room, carport and laundry room. The master bedroom has a king bed and the guest bedroom has two double beds. Each bedroom has it's own full bathroom. The unit has been remodeled with a new kitchen, new baths, comfortable furnishings/beds, central air and heat, and tiled flooring. Membership to a private beach on the Atlantic with fresh water shower and picnic area is included. The beach is a five-minute walk from the unit, as is SUNSET PARK. Beach chairs and beach towels are provided. BICYCLES, WiFi and three flat-screen tvs are included. Key Colony Beach is an island city that offers a quiet, tropical setting with excellent restaurants, boat rentals, charter boats, par three golf, tennis, basketball court, children's park, and resort-type shopping all within walking distance. In combination with our remodeled unit, this a winning vacation location.